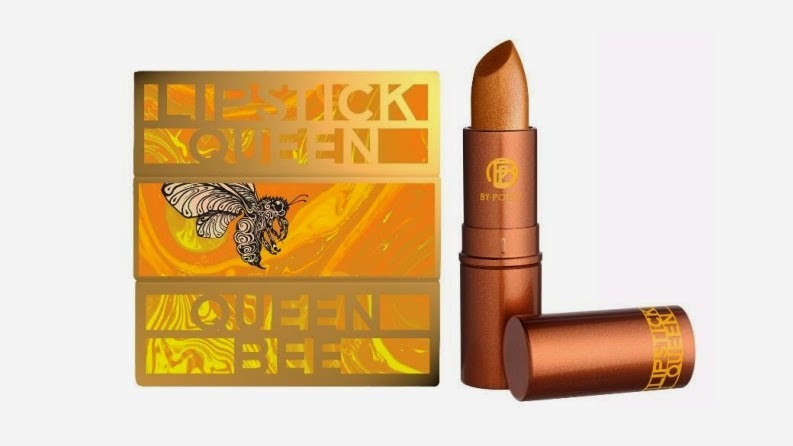 Lipstick Queen Queen Bee retails for $22 USD (£20 GBP) and is said to be "a nourishing lip treatment with a flattering veil of bronze and gold pigments." "Oozing with nourishing ingredients to soothe, repair and hydrate the delicate skin of the lips, Queen Bee is a treatment with a difference. As well as caring for sore, chapped or dry lips with its moisture rich formulation, it laces them with a delicate bronze gold finish, creating a subtly gilded lip effect with a sensual shimmer. Queen Bee's formula is enriched with Royal Jelly, a nourishing and skin-soothing active that replenishes dry lips, as well as chamomile and sunflower extract to help to soothe and heal. The finishing touch is an irresistible honey fragrance that makes this lip treatment almost good enough to eat! Wear Queen Bee on its own or layer it with another shade for extra protected lips with a glistening bronze gold finish." Available now at SpaceNK.com and in-stores, February 2015 at LipstickQueen.com!